This image was cast in bronze using cire perdue technique and covered in a shiny blackcoating through which the metal is partly visible. 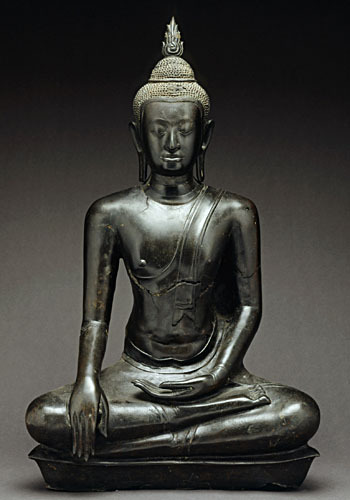 It portrays the Buddha in the posture most commonly found in Thailand: sitting cross-legged on a plinth, right leg folded over left, and making the mudra of taking the earth as witness with his right hand. This gesture symbolizes the Enlightened One’s victory over Mara, Prince of Desires and personification of death. The Buddha’s hair is composed of prominent curls delimited by a strip on the forehead. The characteristic protuberance on top of the head (usnisa) is surmounted by a flame. The soft round face, small curls and elongated forms allow this work to be attributed to the U Thong B style, the earliest stage of Ayutthaya art which blended Khmer and Mon influences. On the other hand, the flame indicates a Ceylonese influence, transmitted via the Sukhotai school. These contradictory features make accurate dating difficult; the problem is exacerbated by the fact that, as many statues were transferred to new locations at the time of the founding of the present-day Thai kingdom in the late 18th century, it is impossible to determine with any precision their original provenance.